Boris is mainly known as a painter, and identified himself as such. However his talent for writing was also acknowledged very early. 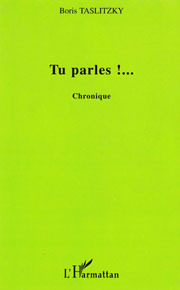 He is the author of the autobiographical chronicle, Tu parles!… (You speak), in 1959 and of collection of short stories, Tambour battant, in 1962. 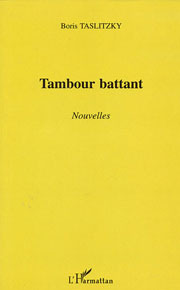 Both were published by Les Éditeurs Français réunis. and were sold-out and were re-published and made available to mass retailing by Harmattan in 2004. 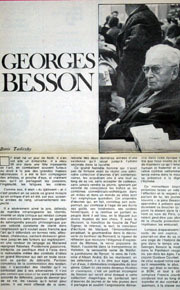 In the same period when Boris created his drawings about current affairs for Ce Soir his reflections on art as well as his political views also appeared on Les Lettres françaises, L'Humanité, France Nouvelle, La Pensée, Europe, La Nouvelle Critique. 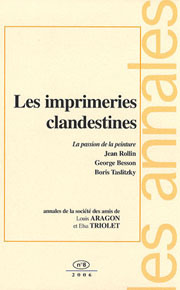 In 2006, a year after Boris' death, Les Annales de la Société des amis de Louis Aragon et Elsa Triolet (The Annals of the Friends' Society of Louis Aragon and Elsa Triolet), n°8, collected a a series of writings called the, Passion of Painting, which included a tribute to Boris by the critic George Besson (1882-1972), an interview with the artist and two of his writings, namely, Mon Atelier (My Studio) and Un trio d'anges (Angels Trio) an unpublished unfinished text about metaphors. 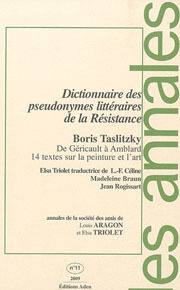 The 11th issue of the Annals, in 2009, published an anthology of texts by Boris about art called, From Gericault To Amblard, 14 Essays on Painting and Art. This selection of writings, published from the post-war period to the end of the 1990s, put into perspective the engagement and the views of the painter-writer in favour of art and artists.